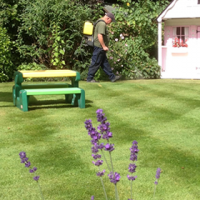 Home > Blog > Lawn Mower Question Series (1 of 6): What’s The Best Type of Lawn Mower For My Lawn? Lawn Mower Question Series (1 of 6): What’s The Best Type of Lawn Mower For My Lawn? Recently, we posted an infographic stating the worst type of lawn mower, and also mentioning that we would be starting a series of blog posts for the most common lawn mower related questions that we receive. This is the first post of six. The size of your lawn and amount of area you have to manoeuvre. 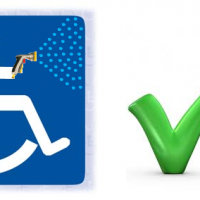 Now lets go through each type of lawn mower with an included summary of advantages and disadvantages to determine which is right for you. You need to have a relatively flat lawn to use this type of mower properly, and regular maintenance will need to be completed more often than a rotary machine. Regular adjustment of the drum blade must be made against the bottom blade, and sharpening the blade will need to be done every other year. Other slight disadvantages are that cylinder mowers struggle to cut long grass. Longer tall grasses will be flattened by the front roller before it gets to the cutting blades. This bowling over of the grass can be annoying as you may have to trim them afterwards. Cylinder mowers are much heavier than the average rotary mower, therefore this must be taken into consideration when operating and storing. For example, if you have to transfer the mower up and down steps to move it between its storage location and lawn, then a cylinder mower would most likely not be an option for you. Cylinder mowers are used on bowling greens and golf greens because of the effectiveness to achieve short cut. Greens mowers are different as they have more blades on the rotating drum, effectively resulting in a finer cut. 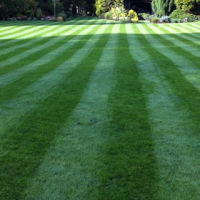 Domestic cylinders have less blades but still achieve a smooth cut on a lawn. The machine must be kept in peek condition at all times as a badly adjusted cylinder mower will effect the look of your lawn, and can lead to other problems. You also need to bear in mind that these machines are expensive, therefore you shouldn’t expect to pay a low price and receive a high quality machine. Can give a short and the cleanest cut compared to other lawn mowers. Rear rollers provide lawn stripes every time. Can be used with or without a collection box for clippings, when just cutting by a very small amount. Require a lawn without any steep bank areas. More expensive than most other lawn mowers. Weigh more than rotary mowers, making them difficult to transfer up areas like garden steps. 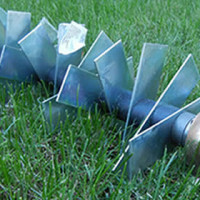 Improper use can easily result in scalping the lawn, and shredding of grass leaf. Not very good for cutting long grass. These machines are the most popular as they cost less, have a lower maintenance cost and are suitable for most types of lawns. These mowers can be purchased with or without a rear roller to suit your requirements. To stripe your lawn and achieve the most attractive look, purchasing a machine with a rear roller is essential. Mowers with rear rollers are more expensive, but are well worth the cost as they can instantly make most lawns look much better. If you already have a rotary mower without a rear roller, separate attachments can be purchased to avoid having to buy a completely new lawn mower. This video from Toro in America shows a good example of a rear roller attachment, how you can benefit, and how to stripe a lawn. Give a nice clean finish when a rear roller is used. Very lightweight without rear roller. Can be used on banks to a certain extent, providing that they aren’t too steep. They can’t cut as short and accurate as cylinder mowers. Require more power to cut properly compared to cylinder mowers. You can only suitably use these machines if you have a large lawn area and suitable storage space. These machines are the same as normal rotary mowers except of course you can sit down while you mow. These machines are a great time saver and provide a faster cut. 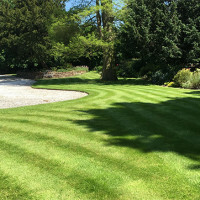 Expensive ride-on mowers do have a rear roller fitted, however, even machines that don’t have them provide a reasonable stripe effect. If mowing your lawn takes a long time with any other machine, and your lawn has no awkward turns or steep banks, a ride-on mower may be your best option. Quicker at completing the job. A much larger collection box than other mowers. Less effort required compared to using other lawn mowers. Tipping grass cuttings can be done mechanically. Higher fuel consumption compared to other mowers. Possible higher maintenance cost as rotary. Can’t be used in tight turn areas or banks. This type of mower isn’t the answer if you want a nice lawn. 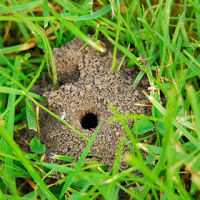 They’re only suitable for smaller lawns as it takes a long time to complete cutting the entire lawn. The primary benefit and reason for purchasing this type of machine is to avoid having to empty a grass collection box. These machines make your lawn look a mess afterwards and are known in the turf industry for causing thatch and the spreading of diseases. Many people believe that mulching offers benefits to the lawn, resulting in improved overall health. This is true to a degree, however, mulching will generally cause a lot more problems than it does benefits. Low running and maintenance cost. Can reduce the need for fertilising. Can increase the spread of weed and moss spores. Can encourage yellow patches if thick patches of mulch are left on the lawn. Can encourage less tolerant grass growth that is less tolerant to wear. Overall, you should take your budget into consideration before purchasing a new machine. Use the advantages and disadvantages of each type of mower to decide on the best machine, and feel free to ask in the comments below for any further lawn mower advice.